Tommy Motswai's work is crammed with bustling activity, of people going about their business, laughing, talking and shouting. Cars and trains rush past, but Tommy Motswai hears none of this, as he has been deaf and mute since birth. What he sees is what is important, and when he puts it down on paper it is a testimony to the joy, excitement and pleasure he sees in the urban world around him. 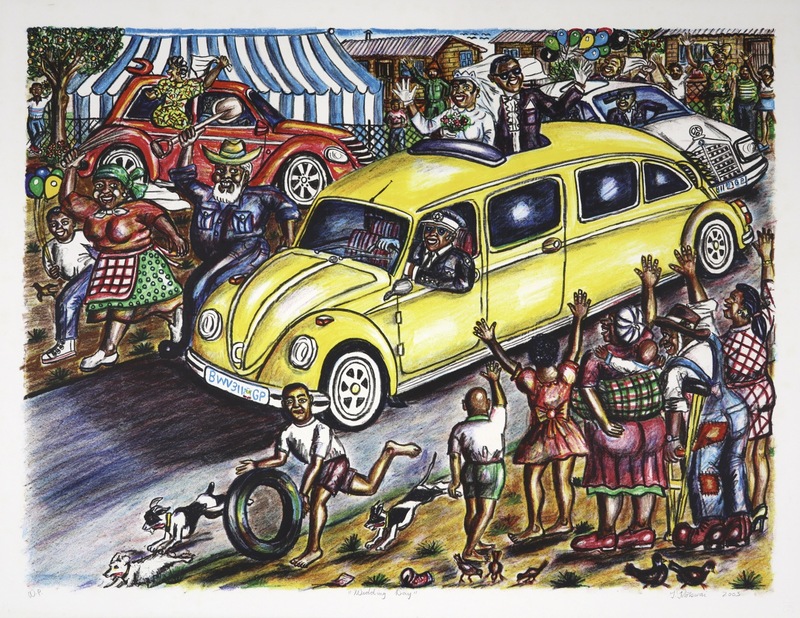 Most of Motswai's prints focus on vehicles, on ways of getting from one place to the next, whether its part of a celebration, a journey or an event. Vehicles are also a way to physically communicate with the world, something Motswai is an expert at. Motswai was born in Johannesburg in 1963 and attended the Kutlwanong school for the deaf from 1968 to 1979. He has since also taught art at Kutlwanong. He began to draw while still at school and continued studying art at the Johannesburg Art Foundation and FUBA after completing school. Dumisani Mabaso taught him at FUBA and was a great inspiration. In 1985 he won a bursary from Sanlam and began exhibiting. In 1986 one of his drawings was shown at an international exhibition in Monte Carlo and in 1987 he won a merit prize in the Volkskas Atelier exhibition. Shortly thereafter he was selected for the Cape Town Triennial and won the Standard Bank Young Artist of the Year award. 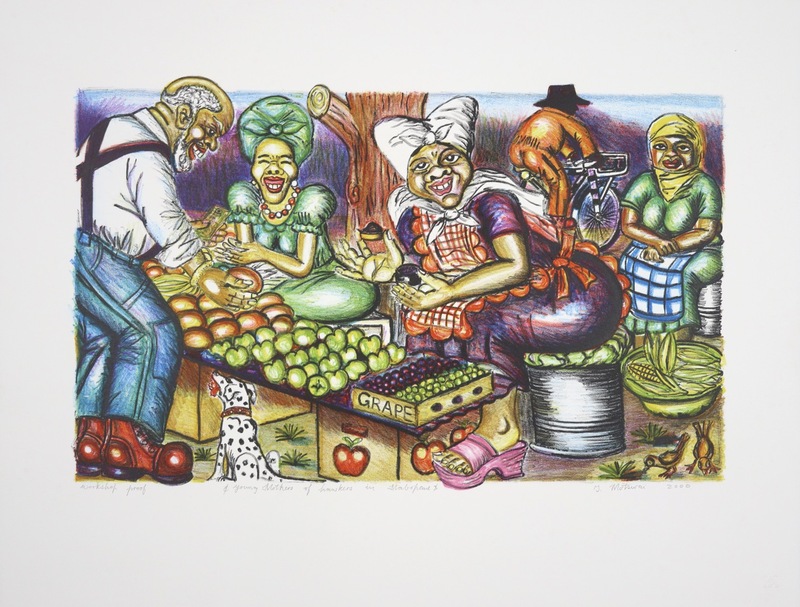 In 1987 he was awarded the Sol Plaatjies Graphic Art Award and the 1987 Excelsior Award. In 1988 Motswai had a solo exhibition at The Goodman Gallery. Motswai works in pastel and various graphic media. 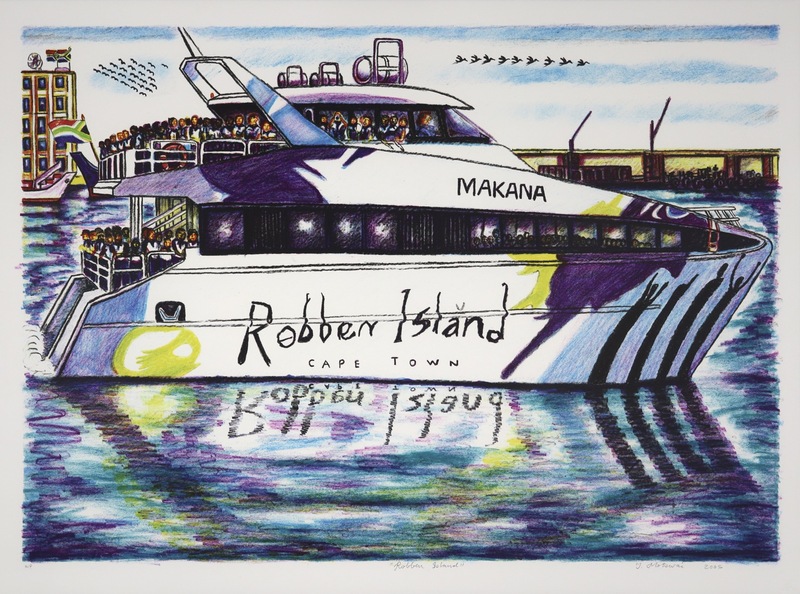 His work is sought after by collectors, and is in major public and private collections throughout South Africa, including The Johannesburg Art Gallery, SA National Gallery and the University of South Africa. 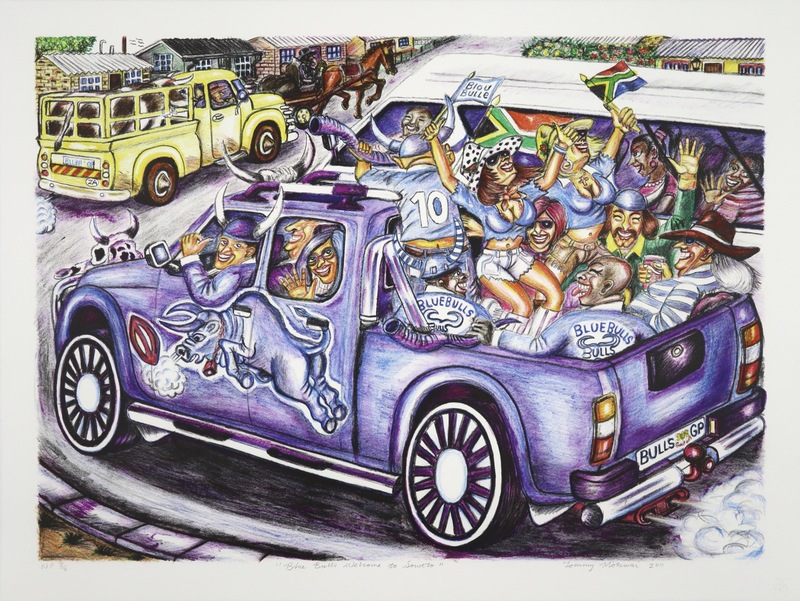 In 1994 Motswai was commissioned by French Vogue to do an illustration for the cover of the magazine that celebrated South Africa's first democratic elections. Tommy Motswai pays great attention to minute detail as he sees it, and consciously makes an effort to record life's important incidents and moments. His work often includes humour and good-natured exchanges between people. He records the happy and cheerful aspects of his world and leaves all frustrations and despair out of his art. 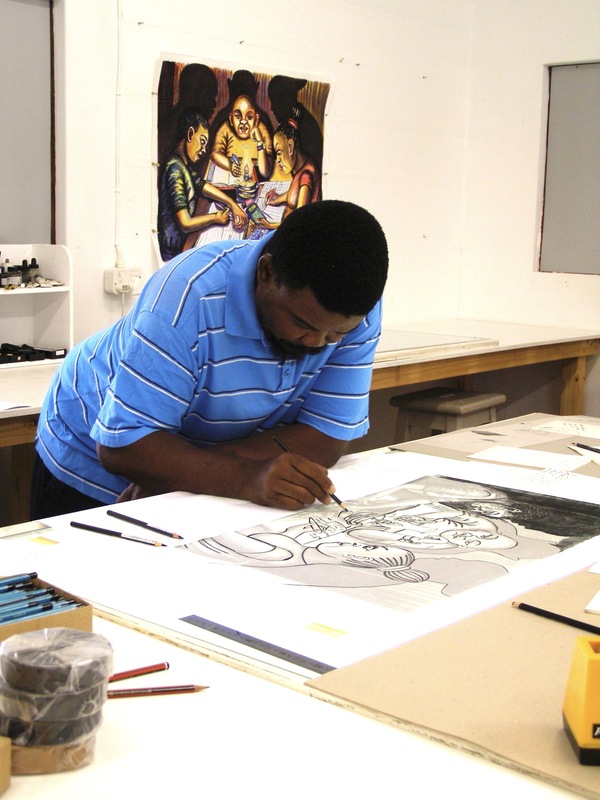 Motswai first worked at The Artists' Press in 1993 and since then has produced numerous editions at the studio. Lithography particularly suits his colourful way of working, and it is always a great pleasure to have him in the studio. His visual skills are remarkably acute, and he intuitively manipulates the complex multiple colour overlays, as if it is something he has always done. 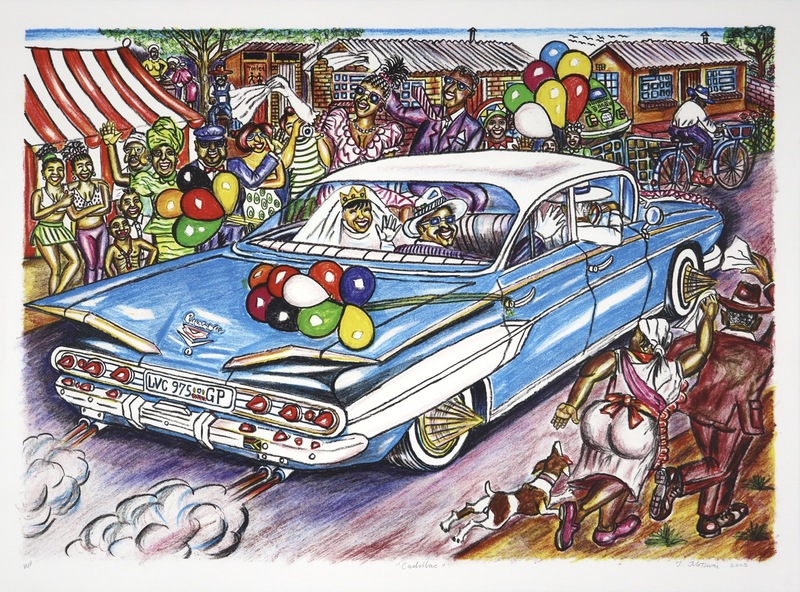 In his latest lithographs, Tommy Motswai examines two aspects of life in South Africa. 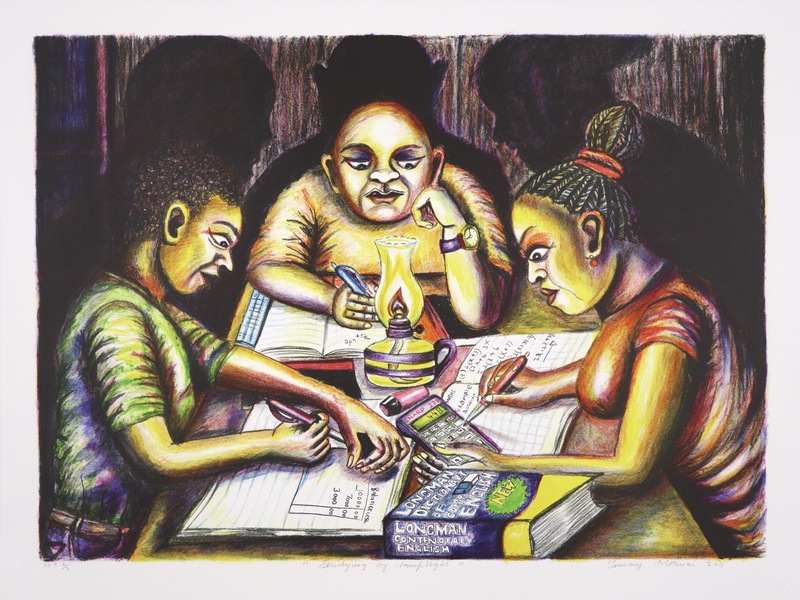 In “Studying by Lamplight”, we see a trio of school students concentrating hard as they study for their matric exams by lamplight. They are there because their teachers are on strike for higher pay, they are working by lamplight because Eskom is “load shedding”. Victims of two of the arms of the ANC led government these students are determined to get their matrics in order to get, as Tommy wrote ‘dream vision mission University”. An image that is ultimately positive as the students are committed to overcoming the hurdles thrown at them by their educators and government. In “Blue Bulls Welcome to Soweto”, Tommy Motswai exuberantly celebrates the first ever game played by the Blue Bulls rugby team in Soweto. The Bulls played the New Zealand Crusader team and beat them to take the Vodacom Super 14 trophy. Rugby has previously been seen as a sport reserved for whites. The Blue Bulls game in Soweto probably did as much to popularize and deracialise rugby as did Mandela when he donned the Springbok jersey and strode onto the field to congratulate the Springboks when they won the World cup in 1995. The Blue Bulls match in Soweto took rugby to the townships where it was welcomed warmly. As Motswai wrote, ”Heroes Blue bulls for SKY life”. A positive image for a positive future. Below is the full text that Tommy Motswai wrote regarding the prints. Motswai is deaf, hence the broken syntax of the writing. 1) Problem before past South Africa. Teachers strikers in nation show the South African government they wanted high money own! But students stand why, students go to home. Studying calm, learn hard home on maths business for the test matric full time. 2) Studying dream vision mission University future. Test matric, they wanted pass matric luck! 3) Problem SA electricity off other days times in weather. 1) Wow hero” Blue Bulls welcome to Soweto in Rugby competition. 2) Fan people support Blue Bulls they want winner happy way enjoy. 3) Heros Blue bulls for SKY life. Super Blue Bulls team well dream, support Springbok future luck in my South Africa World Cup Rugby!